Gives a fresh look to the delicate area under the eyes. A unique formulation containing 24 Carat Gold leaves, precious herbs and botanicals along with pure gold which help in rejuvenating sensitive cells under the eyes and aids in removing dark circles and gives a fresh look to the delicate area under the eyes. 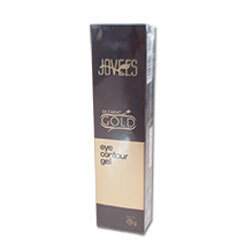 Gently massage Eye Contour Gel with ring finger for two minutes around the eyes by moving finger in a circular motion. Use Eye Contour Gel 15 minutes before going to bed & leave on. 24 Carat Gold Leaves, Amla, Aloe Vera, Almond Oil, Sandalwood Oil, Basil Oil.